It is not easy to combine the words "chocolate" and "100 calories" in the same sentence. While Dark Chocolate is nutritious, you have to be careful with the quantities. 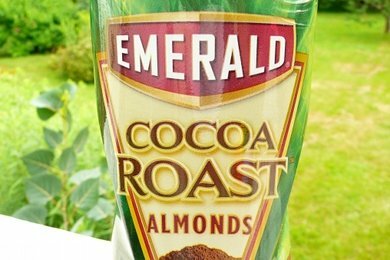 Emerald Cocoa Roast Almonds provide a solution for that late afternoon chocolate craving. They are not to be confused with chocolate covered almonds, which are a lot more fatty. These are just roasted almonds coated in cocoa powder, and they are really delicious. My only concern with these is that one of the ingredients is sucralose, an artificial sweetener. My stand on artificial sweeteners is that there are natural sweeteners such as Honey and Maple Syrup that have nutrients in them! So, use those to sweeten your food and stay away from chemical sweeteners when possible. But, I am making an exception for these almonds because they taste REALLY good and sucralose is the last ingredient on the ingredient list. I wrote to Diamond Foods (producer of Emerald nuts) to find out how much sucralose is included but they wouldn't tell me (secret recipe). My kids, who won't eat roasted almonds (what is wrong with them? ), liked these nuts A LOT. So, what am I to do? I give them these nuts as a snack. Please share your opinions on this trade off. They come in 100 calorie packs! Do NOT buy a big jar like I did - they are hard to stop eating. They are portable and don't need refrigeration. Just toss a bag in your briefcase, backpack, purse, etc. Do you have a "go-to" nut? I absolutely love these nuts! I totally understand the desire to stay away from things that are artificial, but personally, I feel that if used in moderation, artificial things are not inherently evil. I think that being healthy is about having a lifestyle of good choices, with moderate use of things that aren't healthy. Oh, and just to clarify for the discussion, I am certainly not implying that one SHOULD make moderate use of unhealthy food, just that a person COULD make moderate use of it if they wanted to. A lot of things are unhealthy for us if we overindulge. Take alcohol. If a person overdrinks, they can destroy their body and neurological system. However, if a person enjoys a glass of wine with dinner every so often and occasionally has a drink with friends, it would be hard to argue that this person is damaging their health. I feel the same way about food. Certainly one should not make a diet out of artificial and junk food. But if a person does their best to make healthy choices and chooses to make moderate use of food that is perhaps not as healthy, or accept the tradeoff of a small use of an artificial sweetener to enjoy the benefits of a healthy nut, I think this is acceptable. I really like these nuts and one of the things I really like about them is they are not so good that I want to go open a second bag. I am never tempted to eat the whole box but I very much enjoy the bag in front of me. That's a fine line. I usually have a bag of these with an apple on my drive in to work at night. It's sort of like my evening "breakfast". Very satisfying and gives me enough energy for the first part of the evening routine. I used to get in to work and start grazing in the fridge almost immediately. These nuts and an apple help give me control! There are some recipes online for making them at home - sounds very simple but I haven't tried them yet. 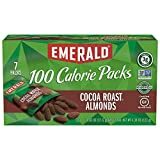 Be careful with Emerald Nuts; some varieties have MSG in them, surprisingly. I can't say that I've eaten these because I didn't notice the sucralose until after I got them. (Then gave them away.) I won't eat the stuff. Of course it's the last ingredient on the list - sucralose is 600 times sweeter than sugar. Sugar isn't what makes cocoa & nuts calorie-laden - it's the chocolate and nuts that do that all on their own. There's nothing wrong with a few grams of sugar in here. I am obsessed w/ these! A friend works for Hershey's and got them at a trade show before they were released on the market. I couldn't wait for them to hit the shelves! Recently, I've really been liking nuts. I go to the bulk section in my supermarket, and get nuts. Salted pistachios, roasted almonds, raw almonds, pecans...I wonder what else :) Personally, I like pistachios and almonds the most! FYI, these and the cinnamon version contain not one but two artificial sweeteners. Sucralose, as you pointed out, and acesulfame potassium, which is also an artificial sweetener. While tasty, I probably won't be buying these again. Try Diamond brand I think they taste better and they use stevia - at least its natural. I love these so much! Im glad they come in 100 calorie packs too. they are a great 3:00 snack when you start to feel peckish. I have these and I love them! Got them in Cocoa Roast and the Cinnamon ones. Cinnamon ones tastes a tiny bit more sugary, but still really good. They are great snack for me to take to school and it has the protein to get me through the day. It took me the longest time to figure out why I didn't like these nuts. I was really hoping these would make a nice somewhat healthy combination, better than say the more typical chocolate covered nut. I usually always read labels, but apparently I didn't read this one close enough. The nuts have an odd taste to them, and I couldn't quite put my finger on it until I read the label closely. The last ingredient is an artificial sweetener--Sucralose--and to me it ruins the taste of the product. There is a definite "off" taste that lingers long after you eat the nuts. I'm not particulary worried about consuming artificial sweeteners, unless they just don't taste good. I suppose if you are used to the off-taste of artificial sweeteners, they you might be okay with this product, but I would never buy or recommend it.